The Kanwar Yatra is an annual event in North India. Thousands of youths take the holy water to long distances and offer it on the deity--Lord Shiva. 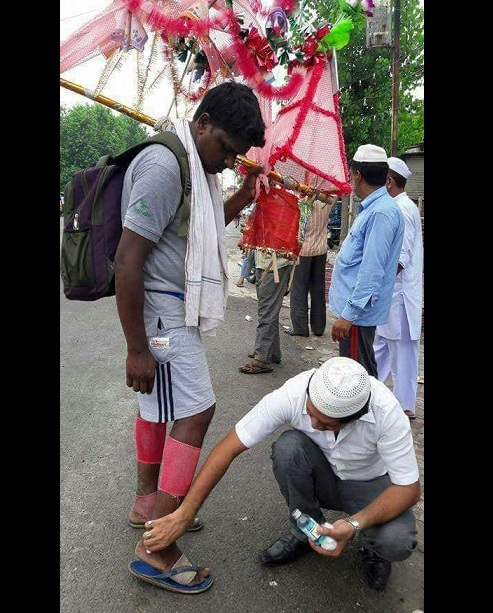 The photograph on the left shows a Muslim man providing first-aid to a Hindu devotee, termed Kanwaria [Kanwariya]--youth taking the Kanwar. The other photograph shows Muslim men offering sherbet to the devotees passing by the town. 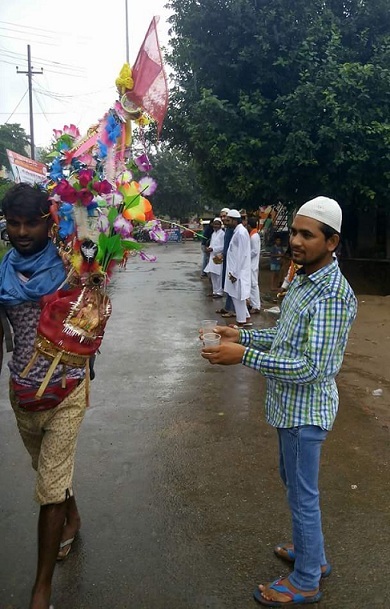 These photographs need to be published here because mainstream media doesn't provide space to them and ignores such examples of communal harmony. During Muslim processions, Hindus offer sherbet at many places. And in case of Hindu processions, Muslim youths too offer their services. This is Indian culture. Unfortunately, we live in an era when even such gestures, that are common in towns, need to be photographed and shared. It is because in big cities, where people have little time to interact and live in suburbs or gated communities, don't have any idea about this common culture and shared heritage. Many just live on Twitter and Facebook [WhatsApp] now, not on streets or mohallas of the mixed townships in cities, qasbahs and villages. For them, it's a different world. Though it is the real India.